Kills 99.99% of germs encountered in away-from-home settngs. 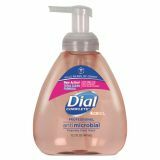 Dial Professional Antibacterial Foaming Hand Wash, Original Scent, 15.2oz, 4/Carton - Dial® Professional Antimicrobial Foaming Hand Wash kills 99.99% of germs encountered in away-from-home settings. Its hypoallergenic foam is as mild as water itself and gentle on skin.